Adams ClearVan®...same great taste for your whitest creations! 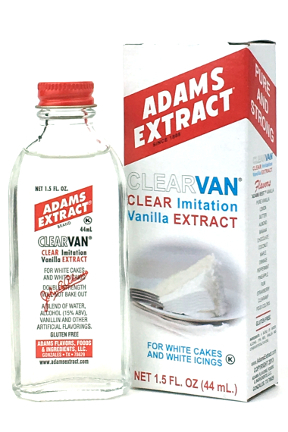 ClearVan® is a high quality, double strength, clear vanilla extract that won't bake or freeze out. Use in white wedding cakes, angel food cakes, white icing or any other time you need a clear vanilla that won't discolor. Ingredients: a blend of water, alcohol (15% ABV), vanillin and other artificial flavors.